HomeFootballLSU offense flounders in 29-0 loss to Alabama. After two weeks of anticipation and build up that included “Free Devin White” billboards across multiple cities and states and endless speculation about what impact his forced absence in the first half would have on LSU’s defense, it was the other side of the ball that ultimately failed as the Tigers once again dropped a game to No. 1 Alabama. 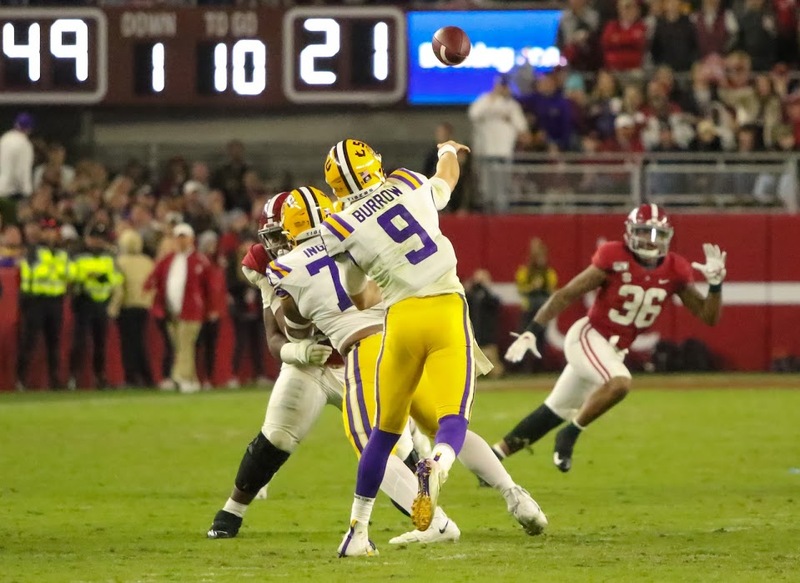 The result is one that has become all too familiar to the LSU faithful, as Murphy’s Law seemed to be in effect for LSU and the Crimson Tide left Tiger Stadium with a 29-0 victory its eighth straight against the Tigers. Nothing seemed to go right for LSU’s offense, as a defining moment of the game came in the fourth quarter when the Tigers’ usually sure-footed kicker Cole Tracy missed a 33-yard field goal attempt that could have avoided the shutout. The kick that sailed wide left marked his first missed attempt under 50 yards this season after successfully kicking his first 19. “It’s a bad night when Cole didn’t even make a field goal,” Orgeron said. The Tigers had yet another chance to score late in the fourth quarter as they drove inside the red zone, but the drive ended with a Joe Burrow interception in the end zone that sealed the shutout. LSU’s scoring chances were few and far between as the offense struggled to get anything going from start to finish. Alabama out-gained the Tigers 576-196 in total yards, and LSU finished the game with just 12 rushing yards on 25 attempts that included five sacks for 29 yards. Just three weeks after dominating Georgia with aggressive play-calling that resulted in the Tigers going for and converting four fourth-down conversions, LSU seemed a bit tepid in that area against the Crimson Tide. On LSU’s first substantial drive of the game, the Tigers reached the Alabama 38-yard line where it faced fourth down two yards away from a first down that would virtually put LSU in field goal range. But the Tigers elected to punt, largely, Orgeron said, due to LSU’s inability to get a push up front. While LSU’s defense did everything it could to contain Alabama quarterback and Heisman Trophy front-runner Tua Tagovailoa, the Tigers stalled on offense time and time again. The Tigers failed to establish any kind of rushing attack in the first half as they went into the break with minus-one rushing yard as a team. This made things tough for Burrow, who spent most of the game trying to avoid pressure before a play could properly develop. Burrow completed 18 of 35 passes for 184 yards in the rout, with most of his success coming when he threw to Justin Jefferson. Jefferson caught six passes for 81 yards. “They were really, really good,” Burrow said. “They had a really good game plan, and they executed it to a T. We just weren’t tough enough, physical enough or ready enough to make the plays. Meanwhile, Tagovailoa and the Crimson Tide slowly chipped away at LSU’s defense to build a lead and choke the life out of the crowd in Tiger Stadium. Tagavailoa finished the game completing 25 of 42 passes for 295 yards and a pair of touchdowns. That constitutes his worst performance of the season thus far, but it still served well enough to do plenty of damage on the Tigers. The Tide first got on the board with a touchdown pass from Tagovailoa to Henry Ruggs that put Alabama up 6-0. Then, a field goal early in the second quarter put Alabama up by nine points. Trailing by nine points late in the first half, one bright spot in the game came when Tagovailoa threw his first interception of the season to Todd Harris on a deep route down the middle of the field. Unfortunately, the interception didn’t amount to much and largely served as a punt as the Tigers went three-and-out due in large part to a sack that nearly became a safety as Burrow went down inside the LSU 1-yard line. The first big blow of the game came on Alabama’s ensuing drive as Tagovailoa hit Jerry Jeudy for a 29-yard pass followed by 25-yard touchdown pass to Irv Smith Jr. for a two-play, 54-yard touchdown drive that put Alabama up 16-0 at the break and seemingly sucked the last bit of remaining air out of the crowd in Death Valley. The second big blow, and the one that virtually put the game out of LSU’s reach came in the form of a 44-yard touchdown run by Tagovailoa which may have served as both a Heisman moment and a game-sealer. The Tide scored once more in the fourth quarter with a Damien Harris 1-yard rush, and that was that. The Tigers had fallen victim once more to Nick Saban and Alabama. As with every win, loss or draw, Orgeron put an emphasis on putting this game behind him and the Tigers. The stakes won’t be as high next week when LSU travels to Fayetteville, Ark., to take on the Razorbacks, but that doesn’t mean it means any less to his team.